This very fine version of Z Z Hill’s classic blues ballad I Need Someone (To Love Me) could hardly be more out of the way. Gaslight records? Tommy Soul? In any event Tommy Soul does the song justice, using a rough baritone voice and the production has all the right ingredients – some nice guitar fills, a churchy organ and some tasteful horns. Z Z’s version came out in 1965 so I guess this must have been recorded around that time. UPDATE ~ Dante Carfagna writes to say that "it's a Kansas City, Missouri 45. 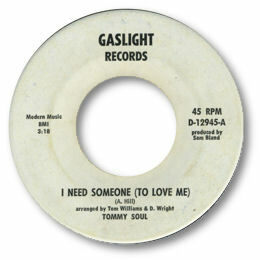 The Gaslight was a club on the east side of town that Tommy used to perform at and it was owned by the producer of the 45, Sam Bland. Tommy was still playing the last time I checked, circa 2001. Thomas Williams is his birth name. For the most part these singles were sold from the bandstand. The label prefix and number (D-12945) is always a sure giveaway that a particular 45 was pressed in Kansas City at the Damon Recording Studio." NEW UPDATE ~ A lady who didn't leave her name - but I guess must be a relative of Tommy's has written to say "Hi -- Tommy Soul's birth name was Tomie Williams. He was a blues singer in KC. He passed on November 9, 2008. Thank you for sharing his music." FURTHER UPDATE ~ Dante writes to date the Gaslight 45 as late 1969 or 1970 and says "sounds crazy given the sound, but I can date it from other things I have that were manufactured by Damon." My thanks as always to Dante Carfangna (see Links) for the extra info.